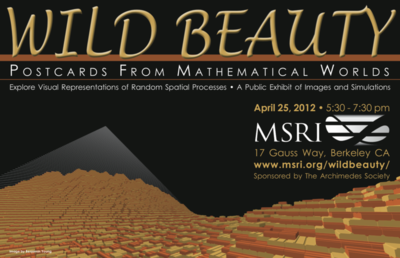 In April 2012, Prof. James Propp organized an event at the Mathematical Sciences Research Institute in Berkeley, California, entitled “Wild Beauty: Postcards from Mathematical Worlds”. The event was a public exhibit of images and simulations related to the field of random spatial processes. Here areexcerpts from the half-hour kickoff-talk given by Prof. Propp at the start of the event (for images, and a full transcript and video, seehttp://msri.org/wildbeauty/). Wildness wasn’t always seen as beautiful. Prior to the Romantic era, the spectacle of untamed nature was a source of fear, not pleasure. Likewise, randomness wasn’t always seen as mathematical. If math is the ultimate form of certain knowledge, what could be more un-mathematical than the things we don’t know, like the face that will be shown by a die that we haven’t rolled yet? If math is about perfection of form, what could be more un-mathematical than the shaggy, unkempt curves we see in turbulent water or in swirling smoke? We live in a Romantic era of mathematics, when the wildness of random processes isn’t just a respectable branch of mathematics, but part of the main trunk, close to the heart of the subject, where all the different sub-disciplines of mathematics converge and converse. There are many reasons for this change: one of them is the electronic computer, which is responsible for all the images you’ll see tonight. Like Galileo’s telescope, the computer lets us explore worlds that were hitherto invisible. But unlike the moons of Jupiter, which were there before Galileo thought to look at them, the worlds of modern mathematics are to a great extent the creation of human minds, and their variety is limited only by what our minds are capable of imagining. In choosing which imaginary worlds to explore, we’re guided by a desire to understand our own world, of course; and like physicists, we often create simplified worlds that capture, and teach us about, some aspect of the world we live in. But pure mathematicians are artists as much as they are scientists, so we often choose worlds based on esthetic criteria. Mathematicians vary in their ideas of mathematical beauty, but we tend to value mathematical systems that combine the classical and the baroque esthetics in a particular way: a classical simplicity in the underlying rules, and a baroque richness of the phenomena that the rules give rise to. We value surprise, and we find symmetry beautiful. So when symmetry catches us by surprise, we are especially gratified, as is the case for some of the worlds I’ll show you tonight. Usually the “worlds” of mathematics are purely conceptual worlds: through familiarity, they become vivid to a mathematician who has studied them, and can come to seem solid, even habitable. But these intuitions are very personal and usually hard to convey. This semester, MSRI has focussed on an area of mathematics that is unusually visual in nature: the study of random spatial processes. The worlds researchers like me study actually look like something, and what they look like, sometimes, are worlds. I’m here to share with you some images that illustrate what we’ve been up to. I call these images postcards for several reasons. First, I don’t make claims for them as art. There is such a thing as mathematical art, and it’s a booming enterprise, but most of the images you’ll see are more like nature photography: attempts to render something natural as accurately as possible. The fact that the natural objects being rendered are imaginary doesn’t change the underlying representational intention. Second, a postcard is something you receive from someone far away, and it’s a given that getting a postcard from a place is not the same as visiting it. We mathematicians spend years learning the tools of mathematics and our reward is the opportunity to spend more years toiling in the application of those tools to problems we have come to care about; so if effort is an index of ascent, then we speak to you from underpopulated mountaintops. I am anxious to disclaim any implication that our elevation is a mark of superiority; it’s just a fact about where we’ve chosen to go. And there is something unbridgeable, or very hard to bridge, about the distance between the mindstate of an intelligent person with no specialized knowledge and another person, possibly not as intelligent, who has spent years exploring some particular domain and acquainting himself or herself with its quirks. Indeed, for many of us researchers, the visual appeal of pictures like this is not the beauty that drives us; instead, we are driven to find beautiful trajectories of thought that let us prove that what these pictures tell us is really true. So, I am not going to be able to tell you everything you may want to know about the images; partly because of the lack of time, and partly because of the intricacy of the backstories of some of the pictures, and partly because of limitations in my own knowledge or my limitations as an explainer. But if I succeed in making you want to know more than I can tell you, I’ll judge the evening a success. atically changing prices seen in the stock market are well-modeled using a one-dimensional Wiener process, like a pollen-grain moving to and fro in a one-dimensional world. Here’s a final thought for you: These images aren’t just postcards from other mathematical worlds. I like to think that they’re also postcards from our world’s future, twenty or fifty years from now, when a new generation of mathematicians, building on our work, will be able to prove things that our generation can only conjecture. Thank you for coming, and enjoy the rest of your evening here at MSRI!